Soak Green gram for minimum 6 hours. Wash and drain the water and wrap it in a cotton cloth overnight. You can see the sprouts on the next day morning. Wash the sprouts once or twice and put them in a mixer grinder. Add Ginger, Cumin seeds, Pepper seeds, and Big onion in the jar. Pour little water and grind it to a fine batter. Transfer this to a bowl. Add Rock salt as per taste. Heat the tawa, pour 1 cup of batter and cook both the sides until golden brown spots appear on top. Eat it along with any Chutney or Vegetable Kurma of your choice. I have learnt this recipe from Vahrehvah and customized it. 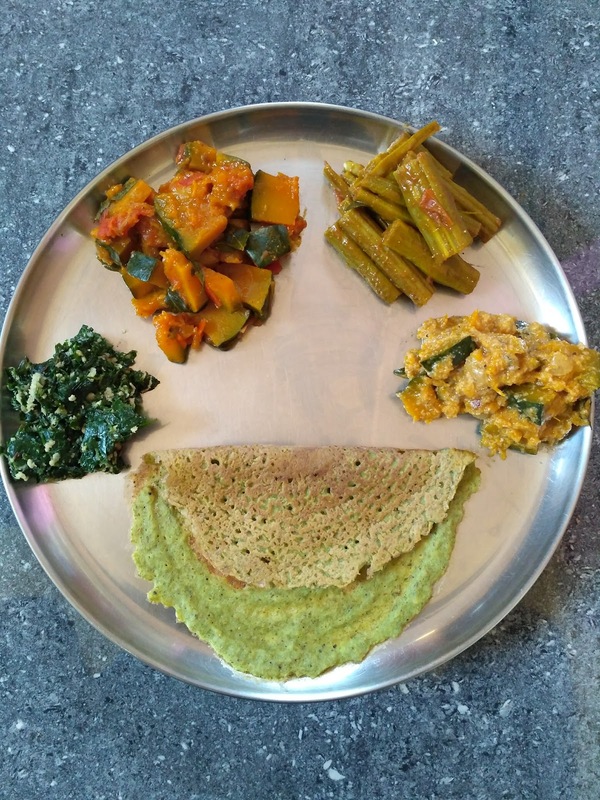 Pesarattu is basically a recipe from Andra Pradesh where the batter is prepared only whole Green gram. In this method, I have sprouted the Green gram instead of using it directly as a pulse. The batter should not be fermented in Pesarattu. So prepare the batter just before making Dosas. Similarly we can make Dosas with different sprouted lentils. Also we can use any millet along with a lentil.